Few video game fans would deny that Horizon: Zero Dawn, a PS4 exclusive which will be hitting the shelves in late February, is one of the most eagerly awaited video games of 2017. Actually, this upcoming open-world game by Killzone franchise creators Guerrilla Games is likely on most gamers wish lists for this year, due to its impressive graphics, great-looking gameplay and appealing female protagonist Aloy. The game also looks like it will feature an impressively detailed open world with plenty of activities to engage in, while Horizon: Zero Dawn’s post-apocalyptic world is also packed with robotic dinosaurs for players to hunt down. Sony recently posted a new cinematic trailer for the game which shows that the game’s mechanical beasts won’t be the only threat players will have to deal with in Horizon: Zero Dawn’s world, as human society is split into several warring tribes in the game’s future world, although protagonist Aloy will also be able to count on allies in her quest. 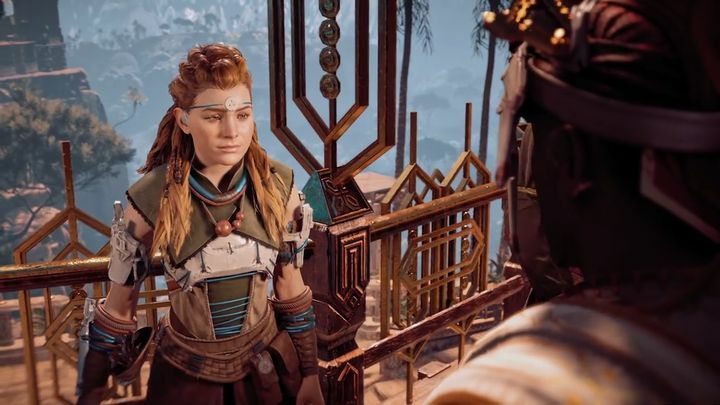 This story trailer shows some of the game’s characters, including members of Aloy’s tribe and also some of the human enemies players will be facing in the game. At some point in the trailer we also see a hologram of a character who appears to be played by American actor Lance Reddick, who reveals little to Aloy besides that he’s “an interested party”.